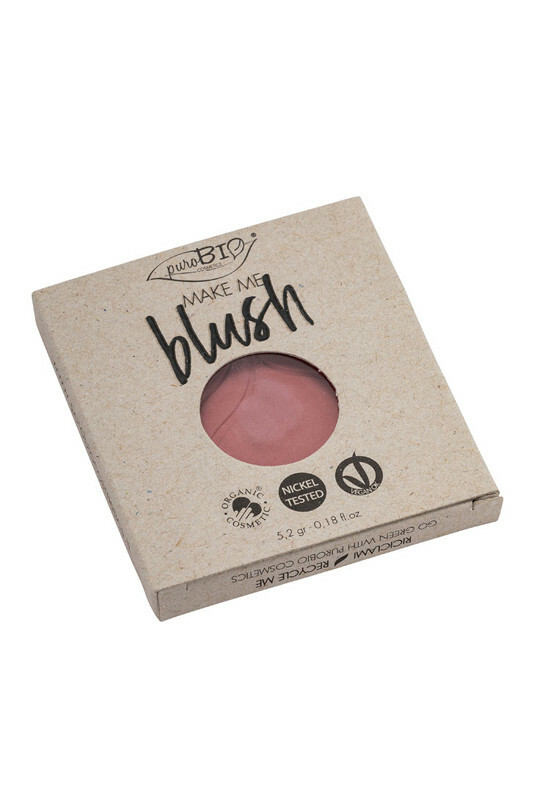 Purobio Vegan Blushes enhance your beautiful cheekbones for a healthy glow! Nickel-free formula, the colours are intense thanks to 100% natural pigments for a natural effect. 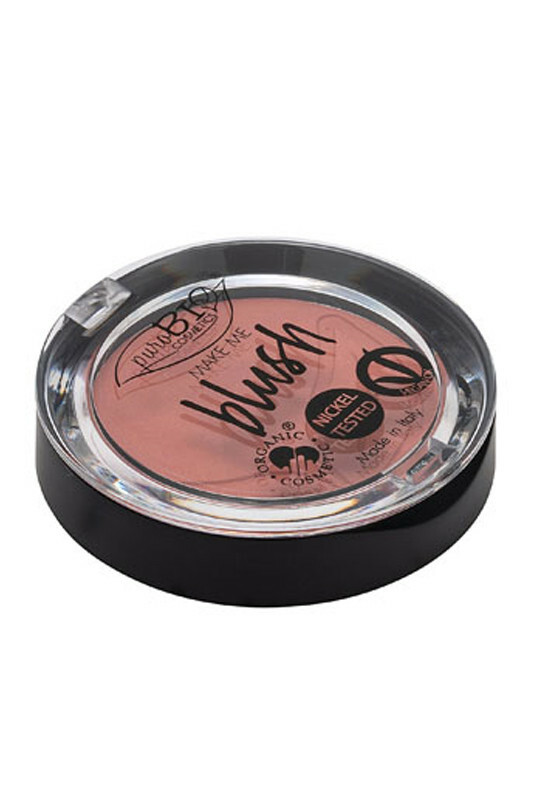 Very long-lasting, they respect your skin with its velvety texture! 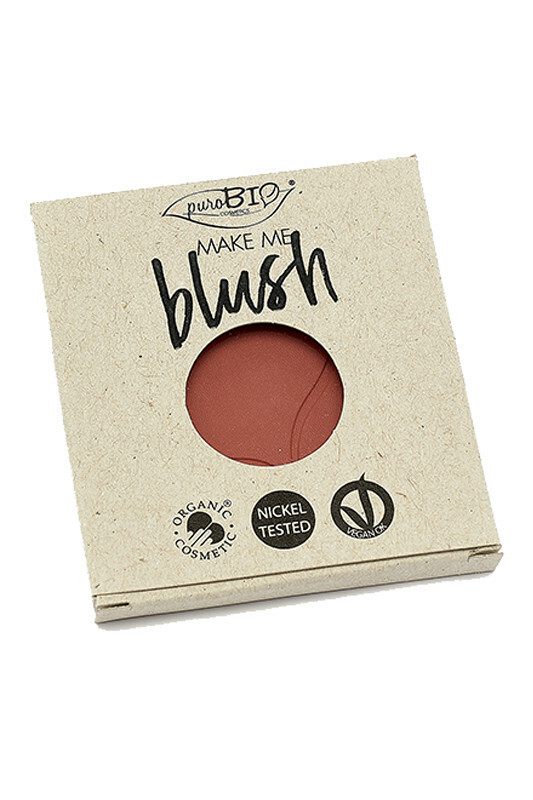 Purobio Organic Blushes are refillable: thanks to its magnetic system, you can buy the refill alone to replace the finished product, or to choose a different color according to your desires of the moment! 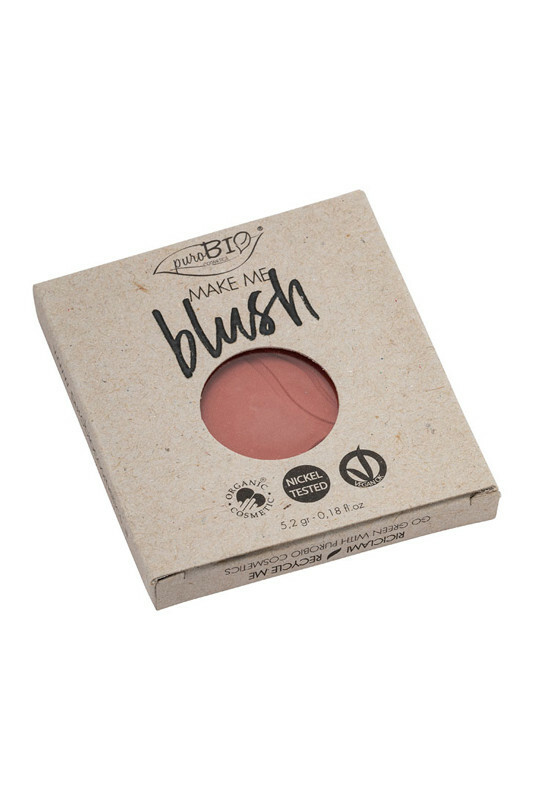 Petit blush parfait, non asséchant, modulable. 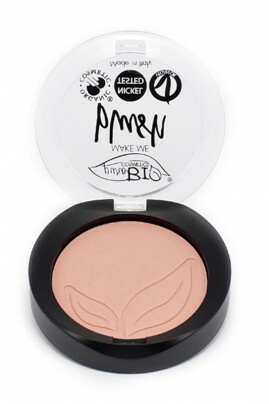 J'avais peur que la teinte Pêche satiné fasse trop orange/carotte mais c'est bien un joli pêche bonne mine, légèrement satiné en effet, qui reste naturel même sur une peau pâle. 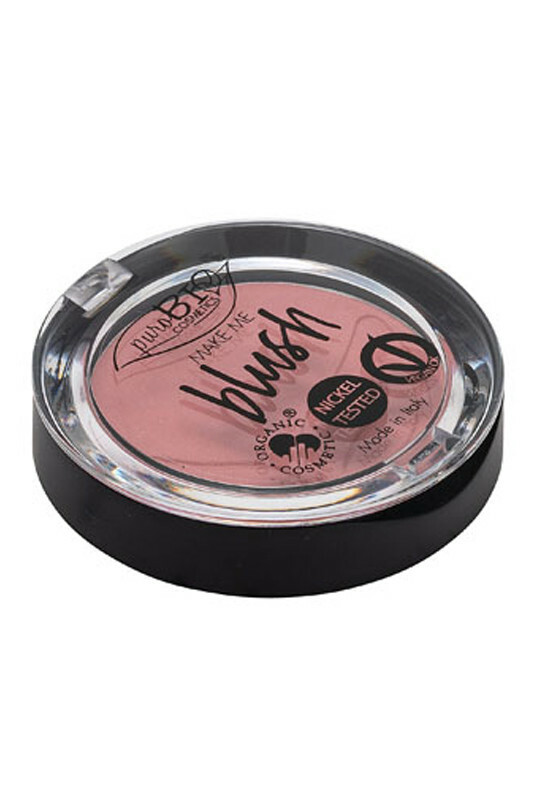 Une jolie teinte presque universelle. 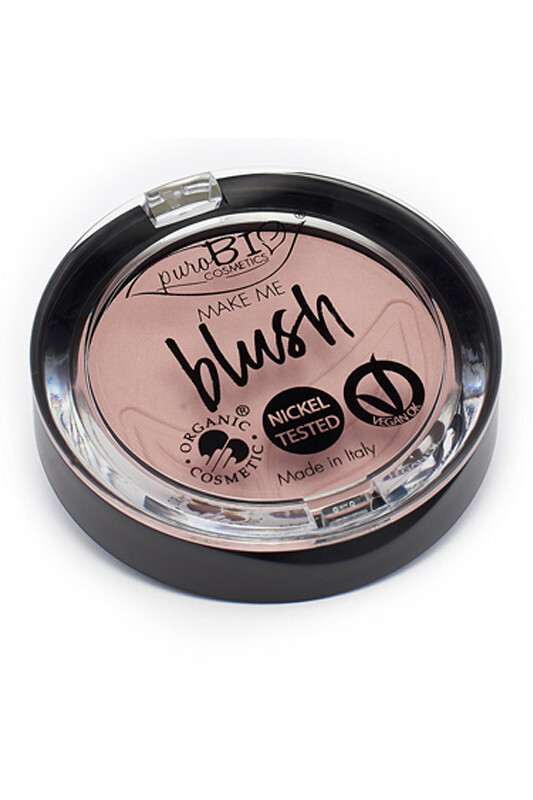 Doll cheekbones with PUROBIO Organic Vegan Blushes! 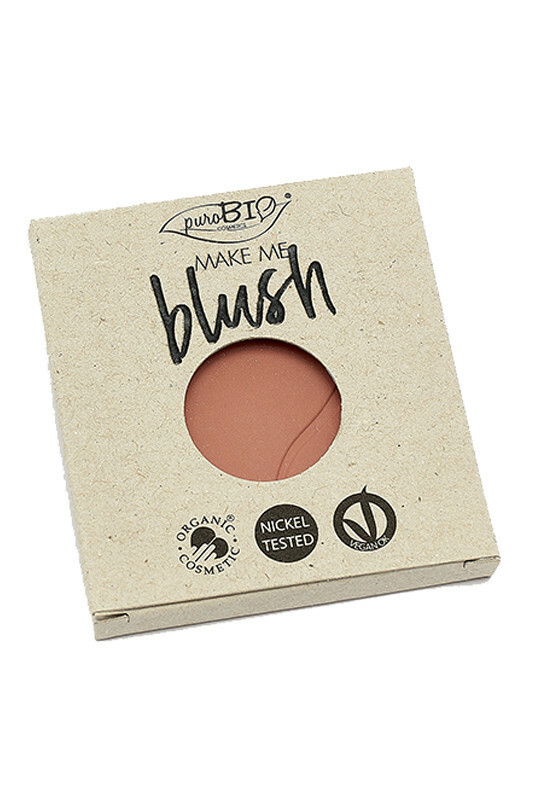 Use the Purobio Precision Brush or Purobio Sculpting Blush Brush, smile and lightly dust blush on the apples of your cheeks in a circular motion and very slightly. 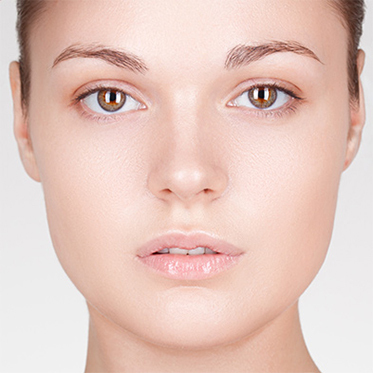 This technique puts a fresh look on your face with a rejuvenating effect. 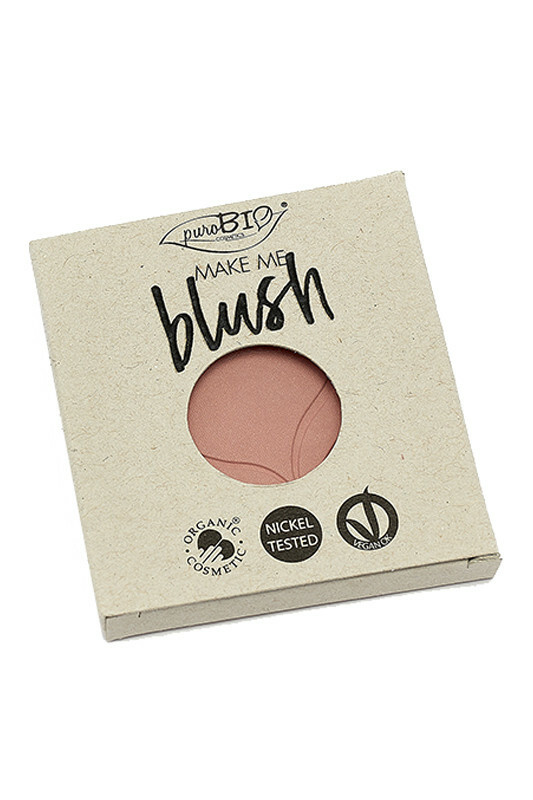 A nickel-free composition in PUROBIO'S Vegan Blushes! 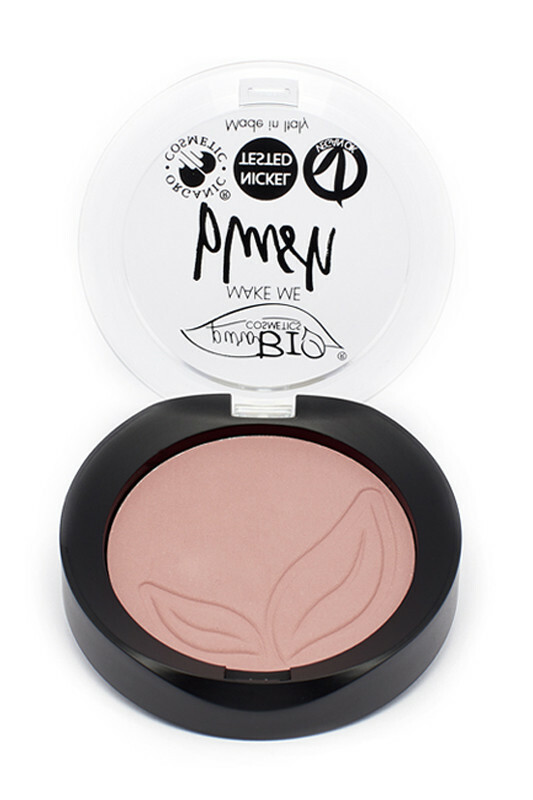 INCI 01 Satin pink : MICA, ZEA MAYS STARCH (ZEA MAYS (CORN) STARCH)*, ZINC STEARATE, OCTYLDODECANOL, SQUALANE, GLYCERYL CAPRYLATE, TOCOPHEROL, LAUROYL LYSINE, PARFUM (FRAGRANCE), ARGANIA SPINOSA KERNEL OIL*, THEOBROMA CACAO SEED EXTRACT (THEOBROMA CACAO (COCOA) SEED EXTRACT), PRUNUS ARMENIACA SEED POWDER (PRUNUS ARMENIACA (APRICOT) SEED POWDER)*, SILICA, BUTYROSPERMUM PARKII BUTTER (BUTYROSPERMUM PARKII (SHEA) BUTTER)*, MACADAMIA TERNIFOLIA SEED OIL*, PRUNUS ARMENIACA KERNEL OIL (PRUNUS ARMENIACA (APRICOT) KERNEL OIL)*, PERSEA GRATISSIMA OIL (PERSEA GRATISSIMA (AVOCADO) OIL)*, PONGAMIA GLABRA SEED OIL, LIMONENE, CITRONELLOL. 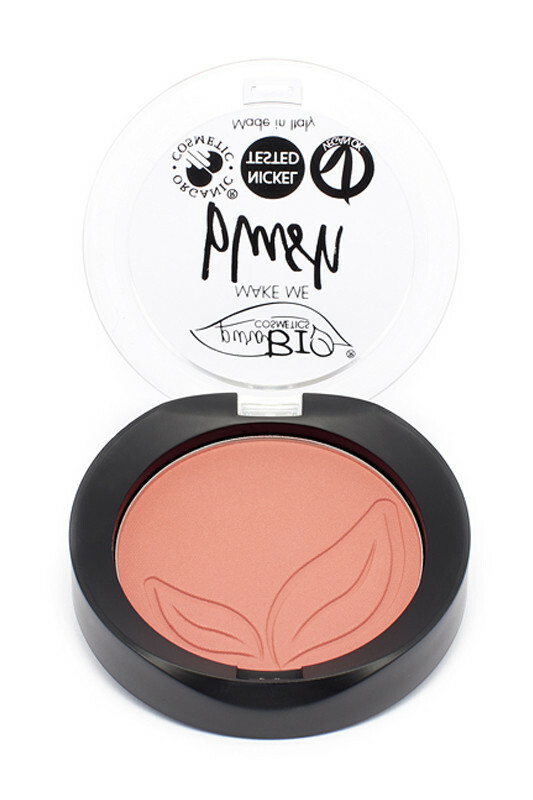 INCI 02 Coral pink : MICA, ZEA MAYS STARCH (ZEA MAYS (CORN) STARCH)*, ZINC STEARATE, OCTYLDODECANOL, SQUALANE, GLYCERYL CAPRYLATE, TOCOPHEROL, LAUROYL LYSINE, PARFUM (FRAGRANCE), ARGANIA SPINOSA KERNEL OIL*, THEOBROMA CACAO SEED EXTRACT (THEOBROMA CACAO (COCOA) SEED EXTRACT), PRUNUS ARMENIACA SEED POWDER (PRUNUS ARMENIACA (APRICOT) SEED POWDER)*, SILICA, BUTYROSPERMUM PARKII BUTTER (BUTYROSPERMUM PARKII (SHEA) BUTTER)*, MACADAMIA TERNIFOLIA SEED OIL*, PRUNUS ARMENIACA KERNEL OIL (PRUNUS ARMENIACA (APRICOT) KERNEL OIL)*, PERSEA GRATISSIMA OIL (PERSEA GRATISSIMA (AVOCADO) OIL)*, PONGAMIA GLABRA SEED OIL, LIMONENE, CITRONELLOL. 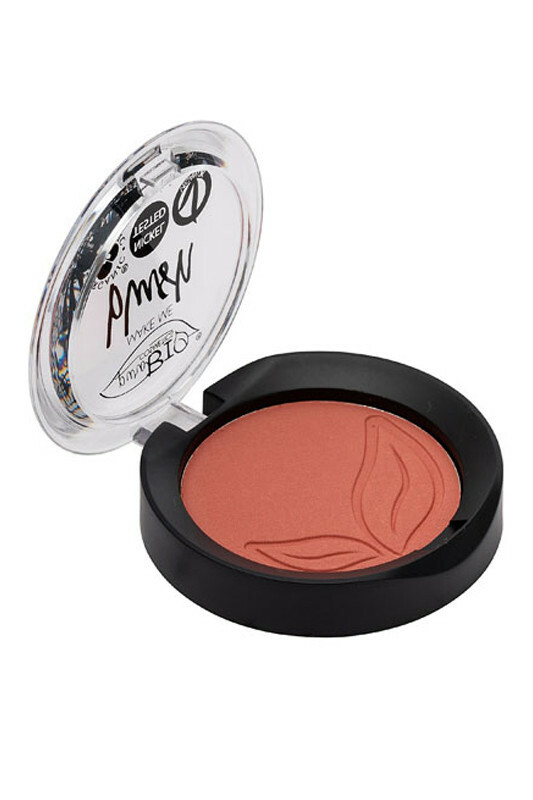 INCI 03 Satin peach : MICA, ZEA MAYS STARCH (ZEA MAYS (CORN) STARCH)*, ZINC STEARATE, OCTYLDODECANOL, SQUALANE, GLYCERYL CAPRYLATE, TOCOPHEROL, LAUROYL LYSINE, PARFUM (FRAGRANCE), ARGANIA SPINOSA KERNEL OIL*, THEOBROMA CACAO SEED EXTRACT (THEOBROMA CACAO (COCOA) SEED EXTRACT), PRUNUS ARMENIACA SEED POWDER (PRUNUS ARMENIACA (APRICOT) SEED POWDER)*, SILICA, BUTYROSPERMUM PARKII BUTTER (BUTYROSPERMUM PARKII (SHEA) BUTTER)*, MACADAMIA TERNIFOLIA SEED OIL*, PRUNUS ARMENIACA KERNEL OIL (PRUNUS ARMENIACA (APRICOT) KERNEL OIL)*, PERSEA GRATISSIMA OIL (PERSEA GRATISSIMA (AVOCADO) OIL)*, PONGAMIA GLABRA SEED OIL, LIMONENE, CITRONELLOL. INCI 04 Brick-red : MICA, ZEA MAYS STARCH (ZEA MAYS (CORN) STARCH)*, ZINC STEARATE, OCTYLDODECANOL, SQUALANE, GLYCERYL CAPRYLATE, TOCOPHEROL, LAUROYL LYSINE, PARFUM (FRAGRANCE), ARGANIA SPINOSA KERNEL OIL*, THEOBROMA CACAO SEED EXTRACT (THEOBROMA CACAO (COCOA) SEED EXTRACT), PRUNUS ARMENIACA SEED POWDER (PRUNUS ARMENIACA (APRICOT) SEED POWDER)*, SILICA, BUTYROSPERMUM PARKII BUTTER (BUTYROSPERMUM PARKII (SHEA) BUTTER)*, MACADAMIA TERNIFOLIA SEED OIL*, PRUNUS ARMENIACA KERNEL OIL (PRUNUS ARMENIACA (APRICOT) KERNEL OIL)*, PERSEA GRATISSIMA OIL (PERSEA GRATISSIMA (AVOCADO) OIL)*, PONGAMIA GLABRA SEED OIL, LIMONENE, CITRONELLOL. 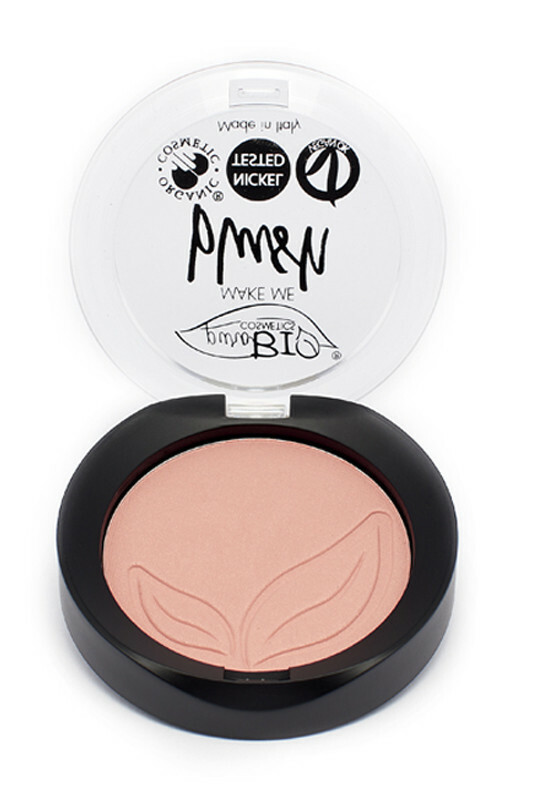 INCI 05 Watermelon : MICA, ZEA MAYS STARCH (ZEA MAYS (CORN) STARCH)*, ZINC STEARATE, OCTYLDODECANOL, SQUALANE, GLYCERYL CAPRYLATE, TOCOPHEROL, LAUROYL LYSINE, PARFUM (FRAGRANCE), ARGANIA SPINOSA KERNEL OIL*, THEOBROMA CACAO SEED EXTRACT (THEOBROMA CACAO (COCOA) SEED EXTRACT), PRUNUS ARMENIACA SEED POWDER (PRUNUS ARMENIACA (APRICOT) SEED POWDER)*, SILICA, BUTYROSPERMUM PARKII BUTTER (BUTYROSPERMUM PARKII (SHEA) BUTTER)*, MACADAMIA TERNIFOLIA SEED OIL*, PRUNUS ARMENIACA KERNEL OIL (PRUNUS ARMENIACA (APRICOT) KERNEL OIL)*, PERSEA GRATISSIMA OIL (PERSEA GRATISSIMA (AVOCADO) OIL)*, PONGAMIA GLABRA SEED OIL, LIMONENE, CITRONELLOL. INCI 06 Cherry blossom : MICA, ZEA MAYS STARCH (ZEA MAYS (CORN) STARCH)*, ZINC STEARATE, OCTYLDODECANOL, SQUALANE, GLYCERYL CAPRYLATE, TOCOPHEROL, LAUROYL LYSINE, PARFUM (FRAGRANCE), ARGANIA SPINOSA KERNEL OIL*, THEOBROMA CACAO SEED EXTRACT (THEOBROMA CACAO (COCOA) SEED EXTRACT), PRUNUS ARMENIACA SEED POWDER (PRUNUS ARMENIACA (APRICOT) SEED POWDER)*, SILICA, BUTYROSPERMUM PARKII BUTTER (BUTYROSPERMUM PARKII (SHEA) BUTTER)*, MACADAMIA TERNIFOLIA SEED OIL*, PRUNUS ARMENIACA KERNEL OIL (PRUNUS ARMENIACA (APRICOT) KERNEL OIL)*, PERSEA GRATISSIMA OIL (PERSEA GRATISSIMA (AVOCADO) OIL)*, PONGAMIA GLABRA SEED OIL, LIMONENE, CITRONELLOL.